Stonehenge is arguably one of the most iconic prehistoric monuments in the UK. Nevertheless, this ancient structure is just one of many henges found across the country. The fame gained by Stonehenge has eclipsed many of the other stone circles found in the UK, sites largely unknown to most people. However, these lesser known structures are interesting and impressive in their own right and also deserve attention. Bryn Celli Ddu, on the island of Anglesy in Wales, is one such ancient monument that was not only a stone circle, but also functioned as a ‘passage tomb’. It was a place to pay respects and protect the remains of ancestors. Bryn Celli Ddu may be translated as ‘The Mound in the Dark Grove’, and some have speculated that during its time of construction, it was located in a large clearing surrounded entirely by a forest. Today, however, there are no signs of a forest apart from a few small trees nearby. Archaeologists have suggested that the original stone circles were set up during the Neolithic period , around 3000 BC. An outer circular bank and an inner ditch encircled the area, which was originally 21 meters (69 feet) in diameter, and defined the parameters of the monument. Today, only the inner ditch is still visible. Within the bank and ditch was a ritual enclosure that included a circle of standing stones. Some of these stones have survived till today. According to archaeologists, the function of Bryn Celli Ddu changed towards the end of the Neolithic, around a thousand years after it was built. 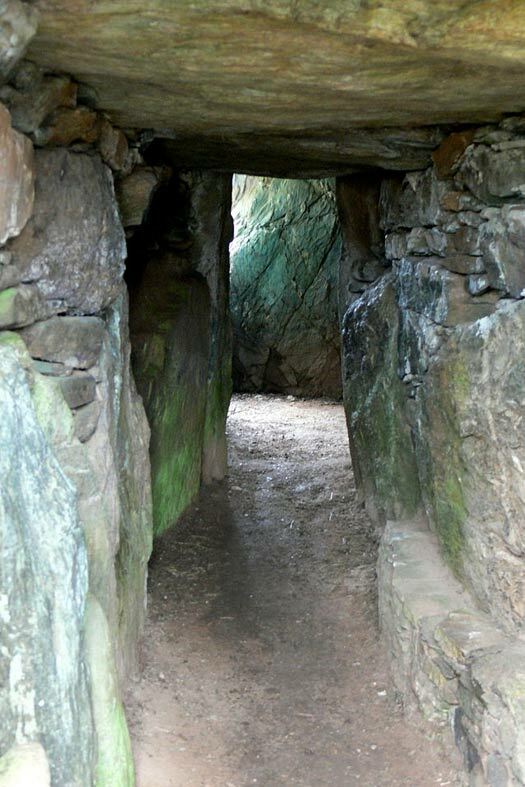 Bryn Celli Ddu became a passage tomb, a type of burial monument found around the Irish seaboard. Some of the standing stones were deliberately destroyed, and a mound was built over the ritual enclosure. Within the mound was a polygonal stone chamber that was reached via an 8 meter (26 foot) long passageway. In the passage, archaeologists have found both burnt and unburnt human bones, as well as other small finds including pieces of quartz, flint arrowheads, a stone bead, and limpet and mussel shells. In a ceremonial pit at the back of the chamber, archaeologists have also discovered a carved stone with a serpentine design. Once thought to be made from stone, it is now believed that they are the remains of a petrified tree trunk. The burial mound would have also had a retaining wall built around it that stretched about 25 meters (82 feet) on each side. 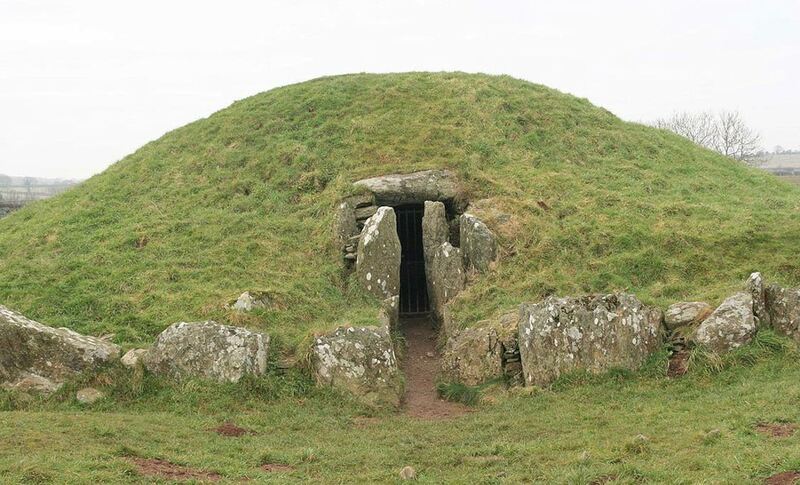 Most people today would agree that the passage tomb was a later alteration to the stone circle of Bryn Celli Ddu. Some, however, have challenged this long-standing interpretation. Steve Burrow, the Curator of Neolithic Archaeology at the National Museum of Wales has argued that the stone circle and the passage tomb co-existed at the same time, and that the former could have been erected as a ritual boundary outside of the latter. Burrow also tested an early 20th century idea that Bryn Celli Ddu was accurately aligned to coincide with the rising sun on the summer solstice , the longest day of the day. It took two tries before Burrow succeeded in recording the rays of light that penetrated down the passage way into the burial chamber on the dawn of the summer solstice. In 1865 Bryn Celli Ddu was first explored seriously, though it was only in 1928 that a thorough excavation was conducted at the site. At the end of the excavation in 1929, some of the structures were repositioned. As of today, Bryn Celli Ddu is a ‘Neolithic Scheduled Monument’, meaning that it is considered an important archaeological site in the country, and receives legal protection from damage and destruction. It is also under the care of Cadw, the historic environment service of the Welsh government. Recently, a team of archaeologists conducted a geophysical survey around Bryn Celli Ddu and they believe they have discovered a cairn cemetery . They also found out that the 5,000-year-old tomb is actually way bigger than they initially believed and have confirmed that a beam of sunshine passes through its main passage and illuminates the entire chamber on the longest day of the year. In all, this Neolithic monument has served many purposes over the centuries, and remains standing as a testament to the understandings and observances of our ancient ancestors. Looking at the map and design of the site, it looks like a ‘womb’. This could very well have been a place where mother nature was worshiped as a ‘giver of life’. The veginal shape of the inner passage and ‘pregnent’ looking mound above it, I believ this could very well be a place for worshipping the divine in female form. These ancient sites have been here for so long, I’m sure that they will have evolved and been used for many different purposes over the years. What is certain is their power to stir our imaginations, and this would have been no different with earlier generations who no longer knew the original purpose. Another interesting article – particularly the bit about the possible petrified tree trunk – thank you!